My published books (detailed below) are available through your local bookseller or on Amazon.com. I publish several times a week my blog about inner/outer landscapes. Once a month, I circulate a newsletter with updates about TEALarbor stories as well as original, short writings of interest to my readership. Writing on the Landscape offers a way through some of the challenges we face when we write, including difficulties in daily life that impede our progress. Writing and nature-based practices that we do repeatedly over time can more deeply connect us to the earth and to ourselves, thus enhancing our written outcome. This book uses rich language to inspire anyone compelled to write or live more fully in connection with self and nature. Writing on the Landscape is a practical, lyrical book aimed at helping blocked writers to become unstuck. 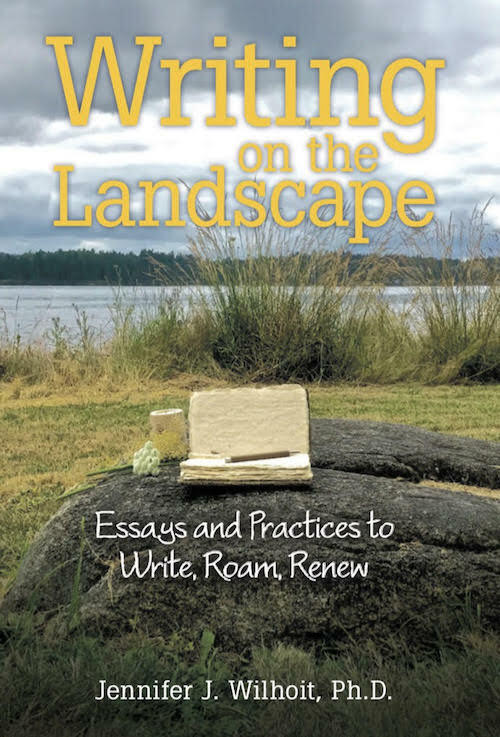 Based on a narrow slice of TEALarbor stories' work, Writing on the Landscape: Essays and Practices to Write, Roam, Renew is especially for aspiring writers, nature lovers, and those who want to deepen their lived expression of their humanity as part of the natural world. READ BLURBS HERE. This book outlines the key issues facing craftswomen in cooperatives and protected area managers, and proposes a plan for meeting their needs. My experience with a crafts cooperative situated on the edge of a protected forest in Rwanda is used to illustrate the concepts from the literature on protected areas management and coops. Chapter one sets the stage for the book; the second chapter describes the craftswomen's struggles. Chapter three discusses several programs designed to reduce conflicts between local people and park staff. The fourth chapter proposes and outlines the concept of a network to connect crafts cooperatives with park managers in a mutually beneficial relationship. The network has the potential to fill some of the remaining gaps in the efforts to minimize people - park conflicts. The final chapter, five, raises further areas for research and exploration. This book will be of interest and use to anybody concerned with the simultaneous protection of the natural world and local subsistence cultures. Crafts collectives form as a survival strategy for artisans in remote areas of the U.S. and abroad. Often artisans are influenced by their rural environment, using images of and resources from nature in their work. Some coops are situated near protected areas with local residents as members; others draw members from a large regional area with no tie to a protected area. Yet in some crafts coops in developing countries, members have incorporated a formal environmental agenda into the coop's by-laws. This research explored two crafts collectives in the U.S. to learn how craftsartists understand conservation in this country. My inquiry focused on the artisans' perceptions of their work, the collective and their community in regard to conservation. The results showed that individual artisans highly value, and are knowledgeable about, their local ecology but do not take formal environmental action as a collective. I propose a model for integrating the ecological, economic and sociopolitical actions of artisan members. The implications of this research for those concerned about crafts and ecology are significant; there is potential for collaboration between artisans and conservationists. In this piece I offer four categories of activities that I consider foundational to gratitude practice. In this article especially for hospice and palliative care professionals, I offer writing practices for healing. Wilhoit, J.J. (2017). The seamlessness of breath and urge. An essay in the book Nature-Inspired Learning and Leading by S. B. Jones, pp. 116-118. Using inspiration as metaphor, this essay lyrically explores the breath and nature as healer as means for nature-inspired growth and leadership. Wilhoit, J.J. (2017). WILD – Wordplay in loving delight. Circles on the Mountain, Issue 23, p. 8. This is a playful poem about the word "wild." Wilhoit, J.J. (2017). Incorporation: A lifetime journey, actually. Circles on the Mountain, Issue 23, p. 27-28. This article explores the role of life transitions, loss, and grief specifically in relationship to the incorporation phase of a wilderness rite of passage. In this article especially for hospice and palliative care professionals, I offer nature practices for healing. Wilhoit, J.J. (2016). Ecotone: Convergence of inner/outer landscapes. An essay in the book Nature Based Leadership by S. B. Jones, pp. 86-88. This essay uses ecotones as metaphor for nature based leadership. Wilhoit, J.J. (2016). What is wild: Ecotones! Circles on the Mountain, Issue 22, pp. 10-12. This article illustrates the ecotone of the wild inner/outer landscape. Wilhoit, J.J. (2016). Napa author publishes 'Pomegranate Jelly'. Napa Valley Publishing. I wrote this article for the Napa Valley Register about a client I served in that area. Wilhoit, J.J. (2015). Local author Dean Goff's memoirs published posthumously. Napa Valley Publishing. Wilhoit, J.J. (2015). Vision in action: Whole embodied practice. Circles on the Mountain, Issue 21, pp. 22-23. Using the phases of a vision fast as structural adhesive, this piece recounts the story of one woman's powerful solo time in wilderness as it becomes manifest in her professional calling. Wilhoit, J.J. (2015). Circle, a poem. Circles on the Mountain, Issue 21, p. 12. The poem celebrates the universal significance of the symbolic circle. Wilhoit, J.J. (2014). The land sews present and past. Circles on the Mountain, Issue 20, pp. 15-16. This prose poem depicts land, place, journeys as healing. Wilhoit, J.J. (2014). The wisdom of 'giving breath to'. Circles on the Mountain, Issue 20, pp. 24-25. The article here reveals how Story, our breath and the natural world inspire us to offer our sacred gifts to the world. Wilhoit, J.J. (2013). An 8 x 10 holiday: Second annual short play festival captures the spirit of the season. Napa Valley Publishing. I was hired to write this newspaper article as a promotion for a unique holiday event in the Napa Valley. Wilhoit, J.J. (2013). Collage: An editorial. Circles on the Mountain, Issue 17, pp. 3-4. As copyeditor again for the Wilderness Guides Council’s annual publication, I offer here an introduction to the compelling issue focused on the theme: Rites of Passage in a Rapidly Changing World. Wilhoit, J.J. (2013). Inner wilderness, outer landscape: Bridging the wild within with the non-wild natural world. Circles on the Mountain, Issue 17, pp. 51-54. Herein I describe the story and nature guiding work I do with people in transition, who want to put their ideas into writing. The article focuses on how nature and our inner selves are interconnected. Wilhoit, J.J. (2012). Corpus in community: An editorial. Circles on the Mountain, Winter 2012, p. 1. This creative nonfiction piece offers an introduction and overview to this annual publication for which I served in 2012 as the copyeditor. The issue focuses on community and "incorporation" (a phase of a rite of passage during which the faster embodies new ways of being in the world). Wilhoit, J.J. (2011). One with the landscape. Circles on the Mountain, Winter 2011, p. 31. This creative nonfiction piece highlights a solo wilderness walk at night. Wilhoit, J.J. (2008). Kaleidoscopic color, tapestry of texture. Daily Expedition Reports, Lindblad Expeditions. In lyrical prose, this short snippet reviews the highlights of a weeklong ecotour focused on gray whales in Baja. Wilhoit, J.J. (2005). Business as usual: The aesthetics of conservation. Tropical News, Vol. 5, No. 2, Fall, p. 5. This piece is a short reverie on the process of starting a new phase of life in an old familiar place, with conservation and the natural world as aesthetic blessings. Wilhoit, J. (2005). Cooperatives: A short history. Cultural Survival Quarterly, Fall 2005, pp. 31-33. The article here offers a concise review of the ideology undergirding the formation of consumer cooperatives, with a special focus on crafts coops. Wilhoit, J. & Cullen, T. (2005). By a thread: Benefits & challenges of being a fair trade crafter. Cultural Survival Quarterly, Fall 2005, pp. 35-38. In this article, a Guatemalan women's weaving coop is the focus of a discussion concerning Fair Trade in the global marketplace.